Three hundred and sixty-five days ago, I was climbing the endless steps of Sacre Coeur in Paris. My wife was at my side. We paused on the 67th step, and, in the warm Parisian sun, we turned and looked back at the City of Lights. We kissed on that 67th step. It was my 67th birthday. Today, I am 68 years old and we are sitting in a cafe in Wells, England. This is in the county of Somerset. I think that’s a beautiful name…Somerset. A few minutes ago we walked down the middle aisle of the nave of the Cathedral. We were approaching the great arches that somehow set this Cathedral apart from the other massive Gothic buildings we’ve seen. I looked up at the simple vaulting on the ceiling. At my feet were large slabs of marble that marked and described the dead who are buried beneath the church. Organ music played quietly and with a simplicity that reflected the architecture. This place totally lacked the high grandeur of a Westminster Abbey. 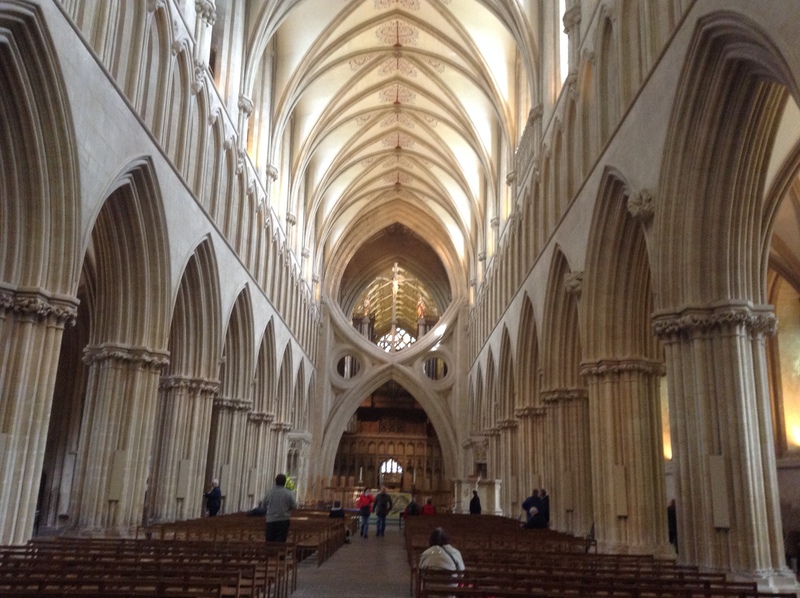 We paused—68 steps along the nave. We happened to be standing on the grave of a married couple, dead now for centuries. They would rest beneath the floor until the Cathedral walls crumbled to the ground. I turned and kissed my wife. We would be together until the stones of our lives crumble. I wonder where we will kiss when I turn 69 years old in 2016. 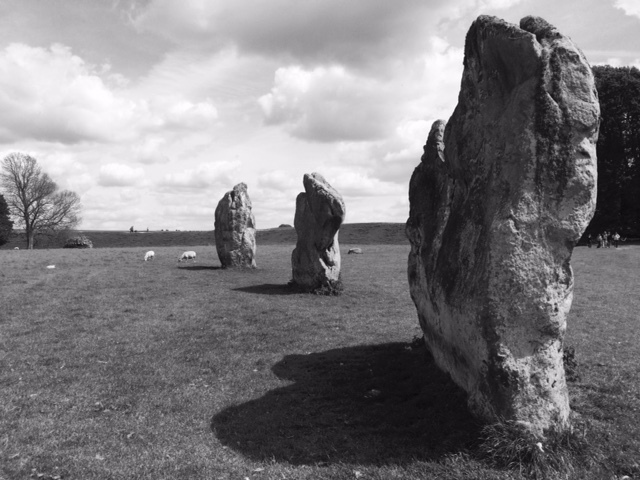 I heard about the haunted pub and the cursed well of Avebury while touring a church in Gloucestershire. I was purchasing a CD of Traditional Country Songs (sung by a small chorus) at the gift shop of St. John the Baptist in Cirencester. I recognized many of the titles from my collection of Irish songs and I was curious as to how it would sound by a choral group. I paid my £12.00. I noticed from a lapel tag that the man behind the gift table was a chap named Jonathan. “Don’t you think this is a beautiful space?” he asked. Being a fan of Green Man legends and mythologies and I was surprised that I had missed the carving of a face with branches growing out of eye sockets, the nose and the eyes. Unless this figure was quite hidden or very tiny, I had overlooked a most fascinating detail. Jonathan locked his cash box and literally leapt from his chair. I leaned back and picked out the figure on the ceiling in less than a minute. I told him that I found symbols of all kinds of great interest. I look for them on tombstones, along the walls of old churches and in the amazing scenes depicted in stained glass windows. I walked toward the large dark wood doors. I was preparing to put on my sunglasses in the bright light when I heard Jonathan say something. I stopped in mid step and spun around. “A haunted well?” I said. There is no way that I could say “no” to this fellow. The promise of such a story had great potential. 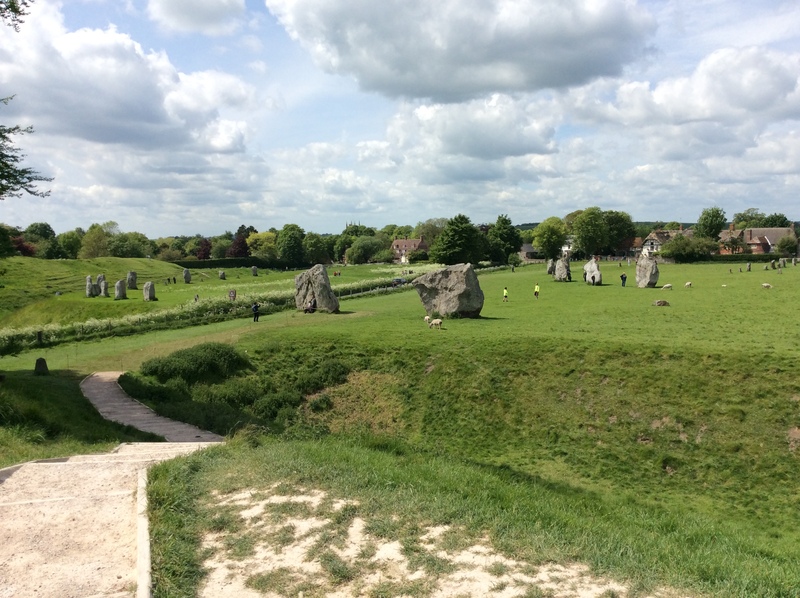 “During the Middle Ages, actually about the year 1500, the village of Avebury was ruled by a Lord of the Manor. Typical in those days. Apparently he had his rheumy old eyes on one of his prettiest milkmaids who worked at one of his farms. She was barely out of puberty. Some have written that she was about fourteen years old. Well, you don’t need a vivid or particularly dirty imagination to figure out what this Manor Lord did with this poor girl. She became pregnant. In those days, women who found themselves in such a situation were almost always blamed for their condition, and her “behavior” was frowned upon by the townspeople. “Oh my God, how sad,” was all I could say. Several hours later we were in the Car Park of Avebury. We walked around the stones. I watched a Druid-like ceremony at one of the standing stones. I kept looking across the field at the pub. It was white, and I think it had a thatched roof. 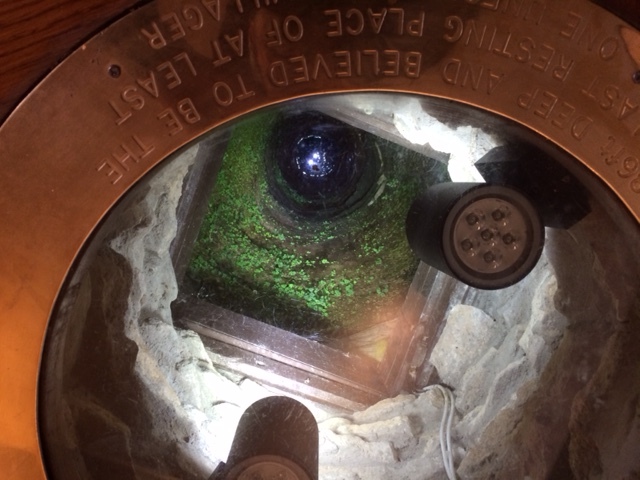 I simply had to look down the well. “Let’s have a quick drink and a light sandwich here,” I said to Mariam. She had heard the story as I did and she was as anxious to see the well as I was. It was crowded with tourists. I went from sitting room to dining room and looked for the well. Finally, I found it in the third dining area I entered. There was a woman sitting at the table sipping a white wine. I apologized and asked if she’d mind if I took a few photos. She said it was no problem. I told her it was the price she paid to sit at a table built over a haunted well. I approached the plexiglass cover. I leaned over and looked down. There were lights along the round wall that made small green-leaved and moss seemed to glow. I looked deeper and say the surface of water, 87 feet down. The light in the room lit the bottom of the well and I could see my own reflection in the still water. I stared, waiting for a small pretty face to look up at me, but none appeared. But, I must admit that I felt a particular unease as I looked down. It was though I was expecting something or someone to speak to me. I could almost hear the girl’s voice. I could almost hear her screams. But, what I seemed to sense, overwhelmingly, was sadness. Someone was crying inside my head. Someone, through no fault of her own, was violated and murdered. I almost began to cry but my wife pulled me away. I assume her spirit wanders the village square, the dining room or the stone circles…looking for someone to protect her. I wondered. If I stayed overnight at the pub or a nearby B & B, and I happened to come face to face with a girl dead over six hundred years…what would I say? How could I find a way to break the chain that keeps her spirit linked to the well? I know I couldn’t. If there is a just God, than He or She must have pity on her lost soul. I walked back to the car park with a leaden heart. I also wondered which local churchyard held the grave of our Lord of the Manor who damaged this young girl’s soul for over half a millennia. Is his soul resting in eternal peace? Or does he too wander the lanes and fields trying to find forgiveness? He does, if there is true justice. I am a conflicting image. Sometimes I appear in churches, carved into the bosses of an archway. At other times, I am associated with pagan symbols of nature worship. 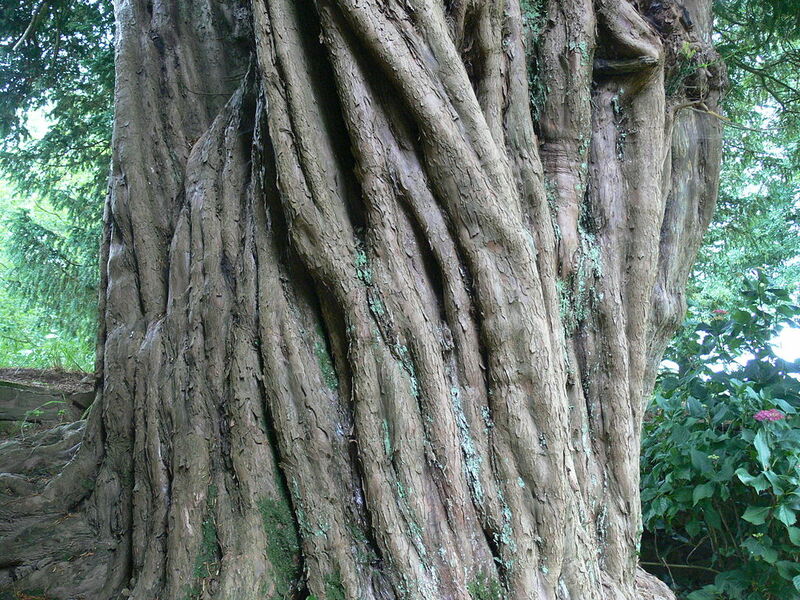 I am a man and I am a tree…one part of me morphs into another. I am called The Green Man by those who study the esoteric arts and druidic symbolism. 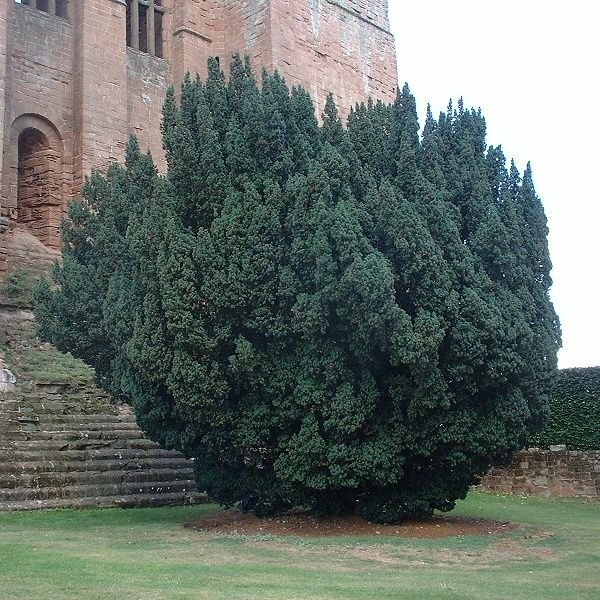 In this story, I am part of the Yew tree. But, I can be seen in any great mass of foliage. You just have to know where to look for me. And, you have to know how to look for me. Just look deep into the forest or the hedges or the copses of trees…and you may be lucky enough to find me. My history is older than the oldest oak. My story begins at the time in history when stories themselves began. To ward off the fear of the darkness, the common folk would gather around campfires or hearth fires and tell stories of ghosts, lost maidens, valiant knights, beautiful queens and dead kings. They would tell tales of the Little Folk in Ireland or the fearsome monsters of mountain lakes like Grendel in Beowulf. Uncountable witches, demons and heroes were the threads that held these narratives together. I live in this deadly tree because nearly every part of it is toxic to humans, except the berry. The beautiful bright red berry. Why am I dwelling in this strange tree of uncountable cemeteries? My job is to look down at the Lychgate at the entrance to the churchyard and keep account of the joys and sorrows that enter and leave the church. The Lychgate is traditionally the place where the shrouded corpse is kept before the priest can emerge from the church and begin the service of burial. In later years, I protected the pall-bearers from the elements. It seems it always rains on the days of burial. The pall bearers would pull their scarves snug around their necks and glance down at the coffin of their friend, their parent, spouse, child or grandparent. They would hold firm to the brass handles. Inside, the priest secures his heavy cloak and takes a final nip from his flask to warm his tongue and throat. They all would meet at the Lychgate to begin the prayers. And, who doesn’t need the prayers? After a few minutes, all would walk slowly to the newly dug grave, lower the corpse and say a final prayer. The priest would go back inside to prepare his sermon for Sunday morning. The pall bearers would head to the nearest pub and toast the departed. The surviving families would go home to mourn and feel the deep emptiness that suddenly is a part of the house. In time, they will begin to live full lives again–until their turn comes to pass through the Lychgate. Sometimes, on a bright joyful day of a wedding, the new couple would leave the church door and reach the Lychgate. There would be a rope tied across the opening. The children standing and giggling nearby would have to be paid a few pence to have the rope untied. I watch over these things. 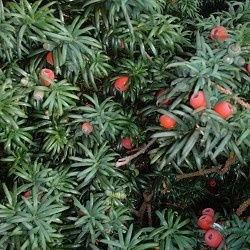 You will never see me in the Yew tree, but I’m there. Someday, I will find the living people who passed through my Lychgate. I will come to them in their dreams and cause them to remember the day they spent near the gate. Some will cry real tears of real sorrow. Some will cry real tears of joy. All these things happen at the Lychgate. I know. I’ve seen it all from my vantage point…hidden in the green foliage of the earth. Take care what you say and do in the protection of the shady forest, for the trees have eyes and ears. I was turned into a sheep on May 26th, but I got better and I’m a much better person because of the experience. England, it’s been said, is a magical country and now I can attest to that being a reality. We started from the car-park, where most of the walks begin. Immediately we began to make wrong turns because of the confusing directions. But we kept on and finally found the start of the Gloucestershire Way, a main footpath used by many locals. But, the steady uphill pace soon began to tire my legs and my lower back pain was making the walk less than pleasant. I swallowed three Ibuprofen and pushed on. The pain lessened a tiny bit but the mystical creature on the top of the hill, hidden by the trees, living in his crumbling castle, began to play his game of time on me. He’s done this before so I wasn’t caught totally by surprise. You see, it’s an ancient game and many have fallen victim to this cruel trickery. The “thing” in the castle (Is it a demon? A man? A witch?) has been watching me struggle up the hill. He (I’ll call it a he for no particular reason) begins to throw little darts, little darts that are seconds at first, then he changes to the minute darts. Soon the darts are weeks…then months…then years. When I nearly reached the top of the hill, I felt (and probably looked) like an old man. I could barely walk. What became of the energy I once had? 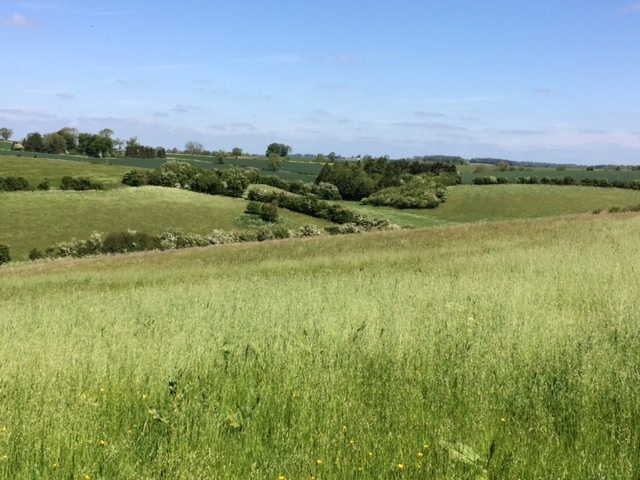 I used to hike the hills of Dorset and I would accelerate my pace as I walked the rise. Now, I sat down feeling dejected and lonely and defeated. I sensed something breathing in the space just behind my left shoulder. I looked and saw my wife strolling on ahead to find the next stile. I turned and there was an old sheep not an arm’s length away. We looked at each other, my small brown human eyes meeting her large wet ovine eyes. “You’re not in a good mood right now, are you,” she said, after making a loud Baaa to the rest of the herd. I felt pretty sad for her so I steered the subject back to me. I began to feel even worse about my situation. 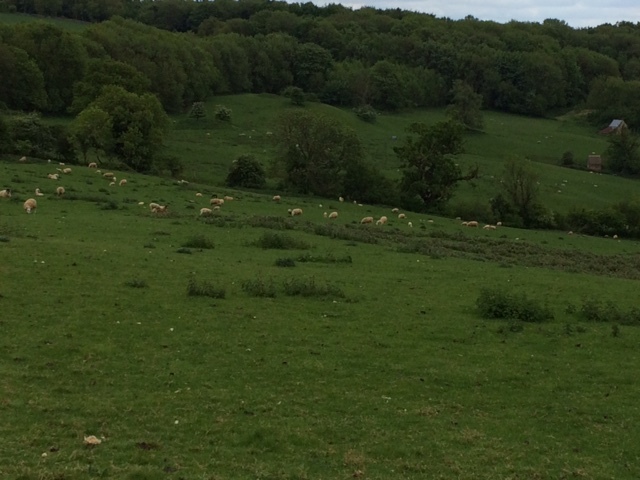 I told the sheep that I had arthritis in my back, my legs, hips, and in my hands. I told her that it hurt me to do almost anything that I used to do so easily. Then I said something to her. Looking back on it all, it was certainly the worst thing I could have said. “Oh, you shouldn’t say such things,” she said harshly. “Easy for you so say,” My words must have hurt her because she looked at me with pity. A strange wind blew down from the hilltop. It was cold but I didn’t feel it. Strange. I shrugged and began to get up so we could finish out walk. Somehow we had taken a wrong turn and we were confused. But, I couldn’t stand up on my two shaky legs. I was on four legs. I wasn’t chilly because I didn’t have my jacket on anymore. I was covered in wool, slightly muddy, but it was wool. She had turned me into a sheep. I was confused for a minute and then I heard all the bleating, but they were words now, they were telling each other how much they loved one another. The ewes were saying how much they loved their lambs. Then I looked down the road and saw something that made my wool stand up on end. It was a truck that had a sign on the side that read: MICHAEL’S MEATS—FRESH FROM THE FARM TO YOU. Two men were walking up the hill toward the pasture. I began to worry. I looked around for Mariam. I saw her standing in the field looking terrified. “I’m over here,” I yelled, but my words came out as a loud Baaaaa. I started thinking quickly. The men were getting close to the pasture fence. I had a feeling they were looking at me. Thoughts came rushing into my mind. I couldn’t stay as a sheep. I would be in some tasty stew in a few weeks. I couldn’t go to an art museum anymore. I couldn’t play with my grandson. I would not be allowed to see the new “Star Wars” movie…in any decent theater. I wouldn’t be able to watch “Dancing With The Stars” anymore. I found the magic sheep and told her I was sorry. I took everything back. I wasn’t meant to be a sheep. Besides, sheep have arthritis too. I felt cold again. Mariam saw me and ran over to me. We stepped to the road and caught a ride with a bearded man who said something we couldn’t hear because of the noise his jeep made. Just as we rounded the corner, I turned back to look again at the pasture. 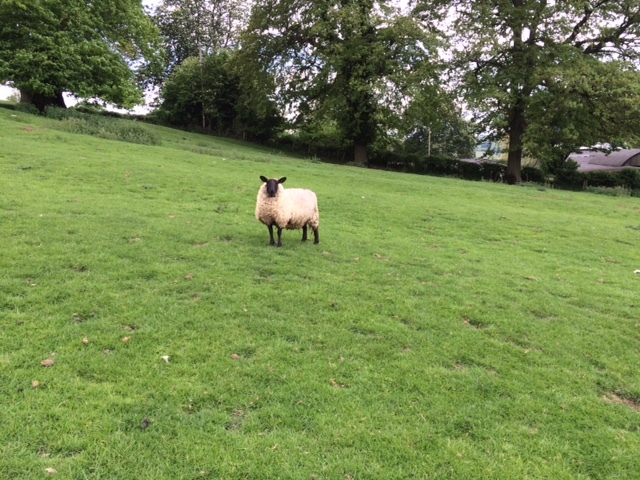 I spotted the magic sheep and she seemed to be sending me some thoughts through the country air. It was clearly shown on the AA Road Atlas of Britain, right there on Map 19. It was a stop I very much wanted to make. We were motoring south on the A34 from Oxford to visit our friends in Romsey. There at a small town of Tufton, was an attraction labelled SILK MILL. Admittedly, when I think of the UK, I think of wool and room-temperature beer and the most baffling game on the planet, Cricket. But, I never think of Silk Mills. Here’s the sum of my knowledge of silk: It comes from a worm, Bombyx mori and it is native to China. How it gets from the worm to my multi-colored neck-tie is one of those mysteries of life I never looked into, like computer chips, digital technology, why New Jersey is called “The Garden State”, the fact that Charlie Manson almost got married, and how gravel-filled barges stay afloat. I knew we needed to go west first then east to get to Tufton. Somewhere in a series of roundabouts, I ended up heading southwest. The roads were narrow (no surprise here) and the hedges were close by the road’s edge (again, no big surprise). We drove for a few miles. I was still holding out for a sign to the Silk Mill. Then, like a vision of Brigadoon, was a church steeple and the thatched roofs of a small village. Before we had a chance to check the Atlas, a road sign appeared. We were in Barton Stacey. It was quite close to Newton Stacey and a few miles away from Sutton Stacey. My diuretic was doing its duty so I found a place to pull over near the church. There was no one about, so I went through the gate and found a totally obscure place among three huge trees and a garbage bin. I took care of business. 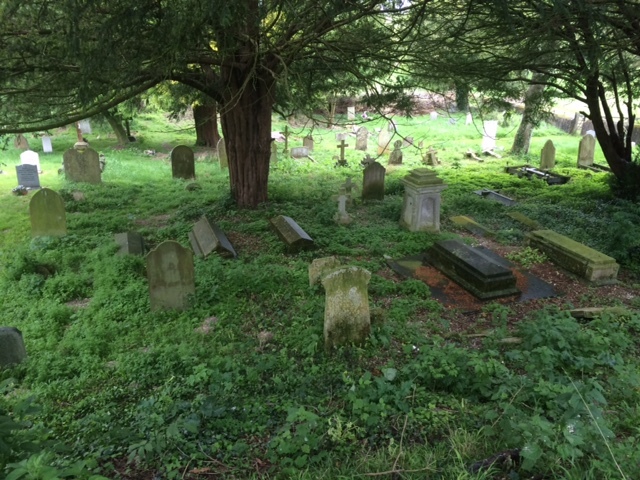 I turned around and found myself looking over one of the most peaceful English churchyards I’ve yet to see in this country…and I’ve seen quite a few. It was quiet as a, well, a churchyard. The tombstones were unreadable because of the accumulation of moss and lichen. I tried the church door and found it locked. A sign said there was a key at the village market across the road. I walked over and asked for the key after buying the latest Guardian. We entered the church and signed the little guest book. I read a small card that explained that the church was about 1,000 years old! I put the card down and zipped my jacket. I was chilled to the bone. I hope for the sake of the faithful that the sermons were kept short. Mariam, meanwhile was looking over a financial poster that detailed the church fund-raising efforts. We were both amazed that they had managed to raise over £10,000! I was reflecting on this amount when I walked back to the store to return the key. How could such a tiny village raise that kind of money? 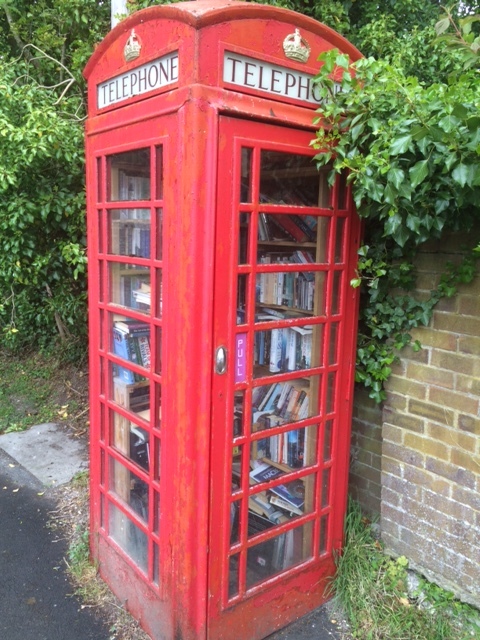 On the way back to the car I walked past an old British Telecom Phone Box. You know, the red ones they show in all the old English movies? But, I had to take a second look (a double-take as they say). This was not a phone booth anymore. It was a lending library! I peeked inside and saw some titles I wouldn’t mind reading, but I already had about 358 titles stored in my iPad so I couldn’t justify borrowing a book. Even if it was from a decommissioned phone booth. We drove on to make our first stop in Winchester. Later, at our friends’ home in Romsey, they said that the money most likely came from the wealthy residents of Barton Stacey. This little rich village could afford to pay for the upkeep of the church…and to keep the town the way they wanted it, quaint and quiet. My best guess is that if I return to Barton Stacey in twenty years, I’d find the same village but I wouldn’t be able to buy a MacDonald’s cheeseburger. That thought was totally fine with me. I was drifting off to sleep. My dreams began. I felt disoriented. Where was I? I was waiting in a room in one of the 38 colleges that make up the University. I had walked here from the hotel, but all the buildings were made of the beautiful honey-colored limestone from the Cotswold hills. This room is where the dons donned their academic robes. The place was heavy with the dust of history…literary history. Books dating back centuries lined the walls. I saw an early copy of “Alice in Wonderland” signed by Lewis Carroll, himself. Was I in the college that gave the world Richard Burton, the actor? Or, Edmund Halley, who made his name on a comet? Was this the room where J.R.R. Tolkien thought about the narrative of the Hobbit books? Did T. S. Elliot walk the path I just walked? In the lecture hall next door I could hear the shuffling of feet and chairs as the runner-up and past winners were taking their seats. I could hear Fineguy6076, who blogged out of Jersey City. There was the instantly recognizable voice of martagoesyo, who wrote from a small town in Ohio. Last years winner had just arrived to a smattering of applause. He may have a large following and was quite an original blogger of 2014, but many readers, including this writer, were put off by his daily output of cats dressed as dogs and disguised as trivets or mid-southern house plants. His wrote under the name of HeSheGuy. The opening speeches droned on and on. The room was warm and I began to grow sleepy. I drifted into a peaceful land of Nod. I began to feel I was near a great dining hall with floating candles and a really bad bully was picking on a guy named Harry. Wait! That was the Great Hall of Christ Church College around the corner. I continued into a light dream-like state. My senses became fully awake. “Order please!” The words came from the lecture hall. I knew then they were about to announce my name and I was to make my arrival through a massive oak door. “Ladies and Gentleman” the calm business-like nature of a man’s tone had indeed broken my REM sleep. I still felt it was my time. I tried to rise but felt a restraint around my waist. I opened my eyes and found myself staring at a small TV monitor mounted on the back of the seat in front of me. On the blue screen was a small icon of an airplane. Behind it was a blue line that connected it to JFK. 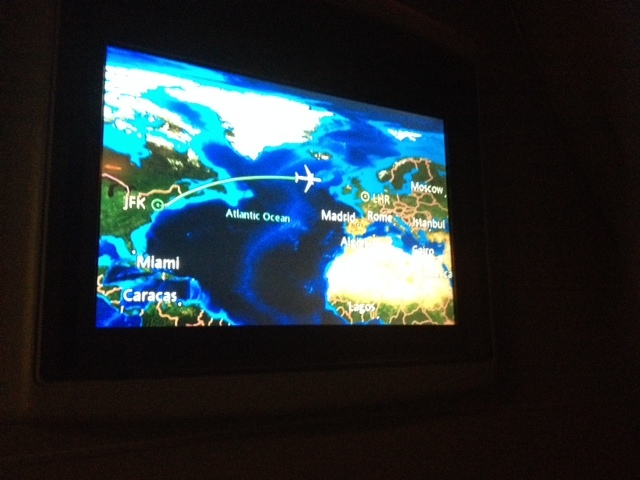 As the plane was set against a blue color, I surmised that we were over an ocean. The little icon seemed to be headed toward the letter LHR. As I regained full awareness, it all came back to me. I wasn’t in Oxford, yet. I was on American Flight #106. Then more reality came flooding back to me. We were caught in traffic somewhere near La Guardia Airport. Despite being picked up three hours early by a car service from the Upper West Side, my wife was beyond frantic. She was convinced we were going to miss the flight. I said we wouldn’t, traffic was always like this out here in Queens. She said we would miss the flight and that it would cost a small fortune to make new arrangements. I suggested, calmly, like a man, that one screwed up ticket was only half as bad as two and I suggested she get on the flight without me. She could breeze past all that and still make it to Gate 14. I told her I would sleep in the airport or go to some cheap motel and find something to amuse me, like going bowling with a woman named Candy from Flushing, and I would catch up to her in London. So, now my watch reads 5:15 am. We’re about 45 minutes away from landing. Some kind of breakfast just got slapped down next to this computer. My eyes turned red about two hours ago. We’re going to pick up our rent car at Heathrow. Our first night is already booked and it’s not that long a drive. Where, you may very well ask, are we going first? My birthday is nine days away. It’s not too early for a gift, is it? Maybe an award for writing something like this? Yes, But Why Can’t You Go Home Again? It’s a cliché. It’s a meme. It’s been repeated a hundred billion times by three hundred billion people. I’ve read Thomas Wolfe’s book by the same name. It was a long time ago. I may be wrong (correct me if I am), but I do not recall Wolfe ever saying exactly why that fact is true. I’m sure it was part of the subtext, but it got by me when I was nineteen. I’m writing a book (a short memoir) of my childhood memories of our family home in Owego, NY. Perhaps that’s why this question is on my mind these days. Or, maybe it’s because I’m looking hard into the eyes of my 68th birthday. Nearly everyone I know has this same feeling. There are a few people I know that continue to live in the house where they grew up. For them, there may not be the sea-change like those that do leave. They wait for a turn on the swing set. They dress for a prom. They turn around and they are telling their children where the peanut butter jar is located. They go into the kitchen to get a cup of tea or a beer and they return to find six grandchildren. I’ve lived through my own “you can’t go home again” moment, but I’m at a loss to explain the small details. Exactly when did that moment occur when I realized it was not my home anymore…just my parents house where I could spend the weekend? When did that moment enter my mind? How long do you have to be away before the comfort and magic of home become only a room to find a bed among storage boxes? Is it a month? Six months? A tour of duty? A year at college? Getting married and buying a home of your own? When did you cross that line? I realize I’m speaking only to those who have (or had) a home in the first place. I’ve never been homeless in America or lived in a shanty-town, like so many of people of the Third World. I can’t speak to that. I had loving parents and siblings. I had a fireplace to warm myself in a drafty house. I had stairs to climb, in tears when I knew I would not be able to fall asleep. Those stairs were there when I was carried in the arms of my father when I fell asleep…exhausted from the heat of play in the heat of summer, or worn out by rolling a giant snowman in January. Often I feel cursed by the fact that I live so deeply in the past. Memories keep me awake at night. I worry about whether someone I haven’t seen in fifty years, still thinks good thoughts about me. In the end, I still don’t comprehend when the moment comes when the home fires go out, and the living room where I fell asleep on the floor (and my mother covers me with a blanket), is now empty. The laughter has stopped, the crying had ended and the arguments are over. 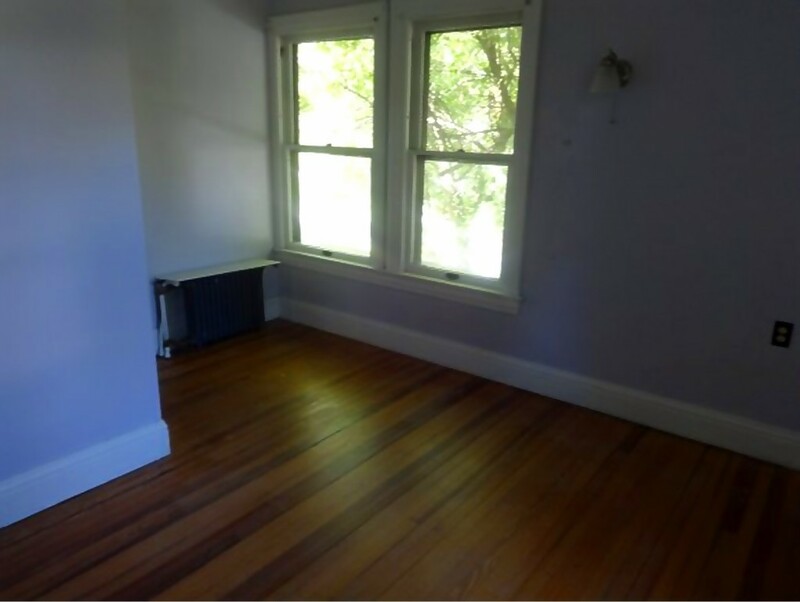 The bedroom I slept in while I struggled through my teenage years is empty now and waiting for someone else. If a child gets to use that room…someday in the distant future…they will move away and then come back to visit. Then they too will know that you can’t come home again.